available on the market today , in a tooth swab for easy and quick use. Informational videos referenced below. Power Swabs system was first introduced in 2008 with a breakthrough, patented teeth whitening technology developed by celebrated dentist Dr. Martin Giniger. Since its inception it has won many awards as the world’s best teeth whitening product. In fact, according to several teeth whitening reviews in the dental literature, Dr. Giniger’s Power Swabs home teeth whitening product is proven to whiten teeth as well as white strips, but with far less sensitivity and greater ease of use. 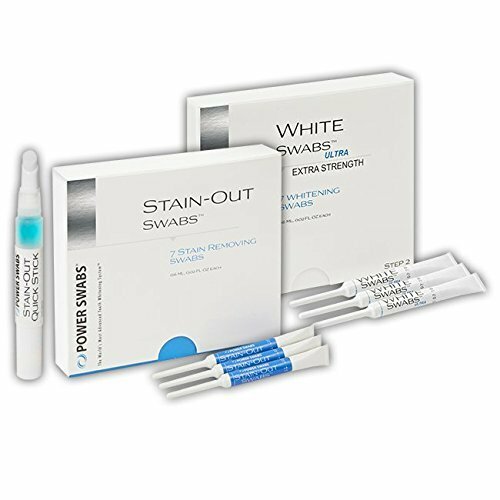 To accomplish this, Power Swabs whitening products use a patented combination of clinically-researched ingredients to reach between enamel and break the molecular bonds between positively charged stained molecules and the negatively charged surfaces they are bound to for a deeper, platinum white clean. An added bonus to the gentle formula is that it works on cosmetic dentistry as well as natural teeth. Dr. Martin Giniger's Power Swabs are unlike any other teeth whitening products on the market, giving professional teeth-whitening results that rival those of a cosmetic dentist, all from the comfort of your home. Its ingenious technology is bound to reform the home teeth whitening experience! The whitening swabs are quick and easy to use with results of 2 shades of improvement after the 1st application in 5 minutes. Power Swabs unique formula is so gentle that it can be used on natural teeth as well as cosmetic dentistry—including crowns, dentures, veneers and dental implants. Dr. Martin Giniger's Power Swabs are conveniently designed to give you the ultimate home teeth whitening experience at a professional level with ease. In teeth whitening reviews, customers give high marks to the sleek swab design, freeing them from messy whitening strips and annoying trays. Power Swabs are easy to use! First run a Stain-Out Swab over your teeth in a circular motion for two minutes. This removes deep stains from the teeth and also helps to re-hydrate the enamel.